Have you heard of Greenscents yet? I think they are such a special brand. Their cleaning products are non-toxic, allergy-friendly and vegan. They are even certified organic by the Soil Association and carry leaping bunny logo to show they are cruelty-free. I am really happy to have been able to test some of their products which I’ve been really impressed with actually. I normally use Ecover eco-friendly cleaning products but now that I’ve tried Greenscents, I think their products are in many ways better than Ecover’s. Greenscents’ cleaning products contain ethically-sourced ingredients which probably couldn’t be any more natural. The products contain no SLES/SLS/ALS, phosphates, enzymes, chlorine bleaches, optical brighteners, gluten or alcohol. What’s more, their nonscents range is as pure and hypoallergenic as possible, suitable for the most sensitive type of skin. So far I have not tested many natural and eco-friendly laundry liquids, I’ve been mainly using Ecover laundry liquid which is easy to buy from a larger supermarket. The problem with natural laundry cleaning products is that there are not as effective as the conventional ones. Greenscents Lavender laundry liquid is no exception. If you have stains on your clothes, the best is to tackle them before you put your clothes in the washing machine. I find that Dr. Bronner’s liquid soap works quite well for this purpose. The Citrus loo cleaner from Greenscents smells lovely and works well for refreshing the toilet. There is an option to get a minty loo cleaner as well, if citrus scent is not your thing. I don’t normally use laundry conditioner but I was happy to test this Minty laundry conditioner from Greenscents. At first I thought that the mint scent and laundry wouldn’t go well together but I was wrong actually. After using this conditioner my clothes smelled really fresh and slightly minty but the scent wasn’t overpowering. The clothes felt softer and lovely to the touch as well. I was quite happy with the result and would definitely recommend this product. 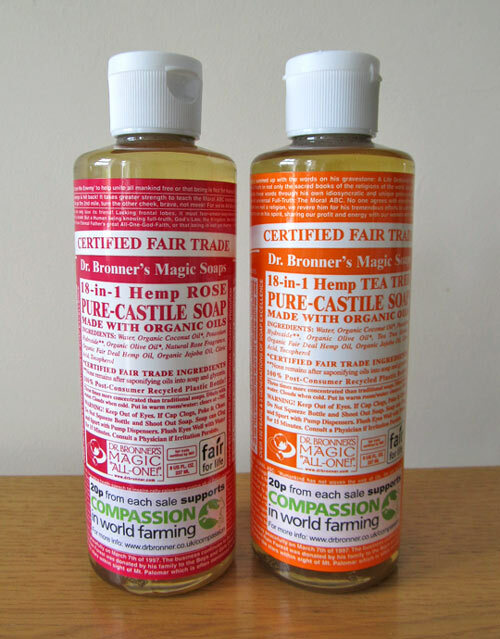 Apart from the minty scent, Greenscents also offer a lavender version of this product. 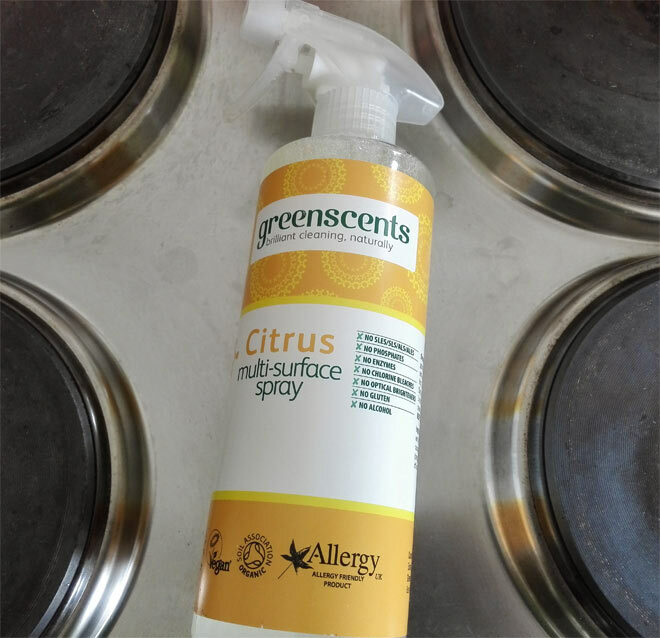 This multi-surface spray was my favourite product out of all the Greenscents’ products that I’ve tried. The formula is really concentrated and it doesn’t only work amazingly well for cleaning the cooker but it also does a brilliant job for cleaning the bathroom. This product is so much better than the Ecover multi-purpose liquid which I would normally use. The liquid is quite thick and for this reason you can easily dilute it by transferring it into another bottle and mix it with water. You will still get a powerful cleaning spray like that but it will last you much longer. I was really impressed with how well this spray worked on a dirty bath. I would spray the whole bath with this product and then leave it for a bit to work its magic. When scrubbing the bath I felt the dirt came off easily and I didn’t need much effort to make my bath sparkling clean. The Ecover multi-purpose liquid doesn’t work as well. I loved the citrus scent of this multi-surface spray but you could also try minty, herbal, lavender and nonscents blends. 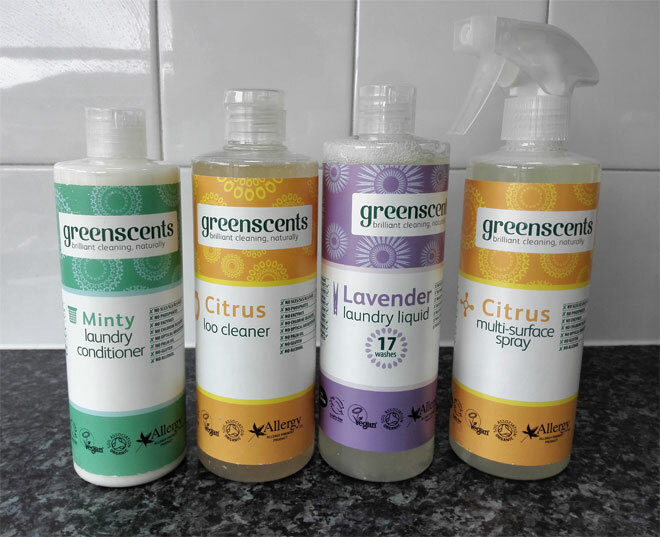 All in all, Greenscents natural cleaning products are well worth trying if you want to avoid various toxins and skin irritants. And let’s not forget that they are vegan and cruelty-free as well which makes them even more attractive option. You can buy them directly on Greenscents’ website or on Amazon.